This quaintly decorated 2 bedroom, 2 bathroom condo is on the sixth floor of Sugar Top overlooking the slopes of Sugar Mountain. It has access to the indoor pool, Jacuzzi, sauna, WiFi and weight room on the main floor Lobby. The unit will accommodate 6 people with a King bed in each of the bedrooms and a Double sized sleeper sofa in the living area. The unit features a comfortable atmosphere and offers a full kitchen, complementary WiFi and a TV in the living area as well as both bedrooms. Relax on the deck or get out and explore all that the surrounding mountains have to offer. 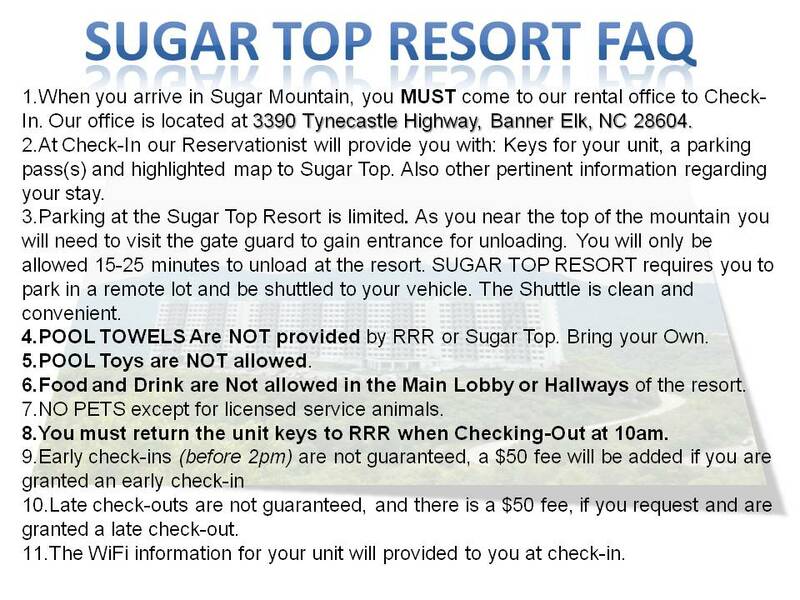 Sugar Top has a shuttle system if you’re unable to park in the main lot during the busy seasons. Please be advised that the parking shuttle is run by SugarTop. Resort Real Estate and Rentals has no control over the shuttle system. However, we have not had any issues with this. Our SugarTop Condos are Non-smoking. Absolutely NO PETS.